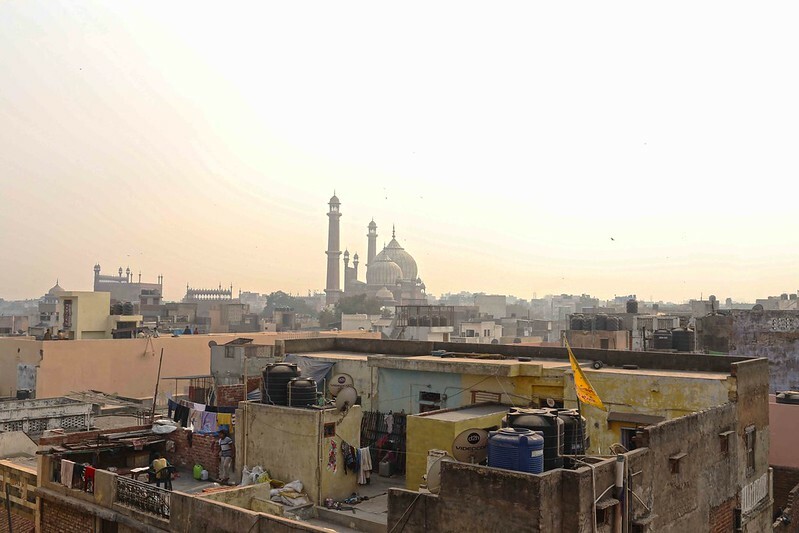 A panorama of immense grandeur, the Jama Masjid soars far above the hubbub. 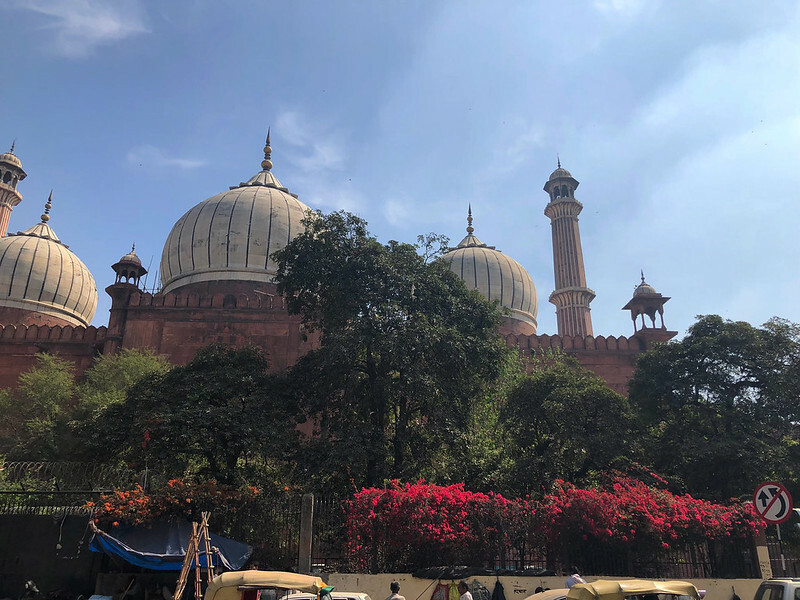 Small wonder then countless tourists the world over flock to this Mughal-era masterpiece. But there’s an easy way to avoid the crowds almost altogether. By perching yourself facing the rear of the mosque, you’ll pretty much have it all to yourself. In fact, you’re now standing at its most important area, namely, the Mecca-facing western wall. 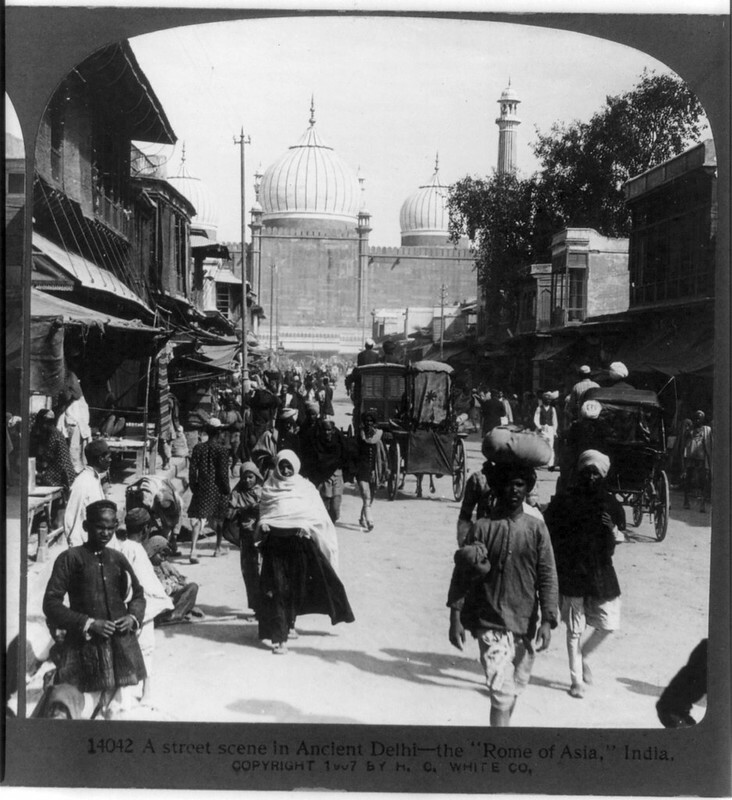 When thousands of Muslims do gather inside the Jama Masjid, they pray towards that very wall. 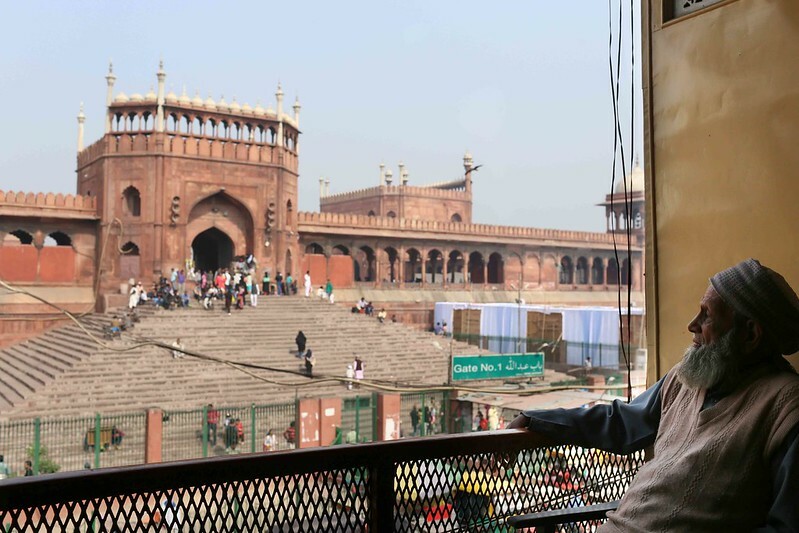 From this vantage point, the Jama Masjid offers elements of beauty that go unnoticed elsewhere. Particularly poetic is the outline of an arched mihrab pressed on the red sandstone wall just under the central dome. The pattern appears so fragile it might vanish altogether if the sun beamed too brightly. 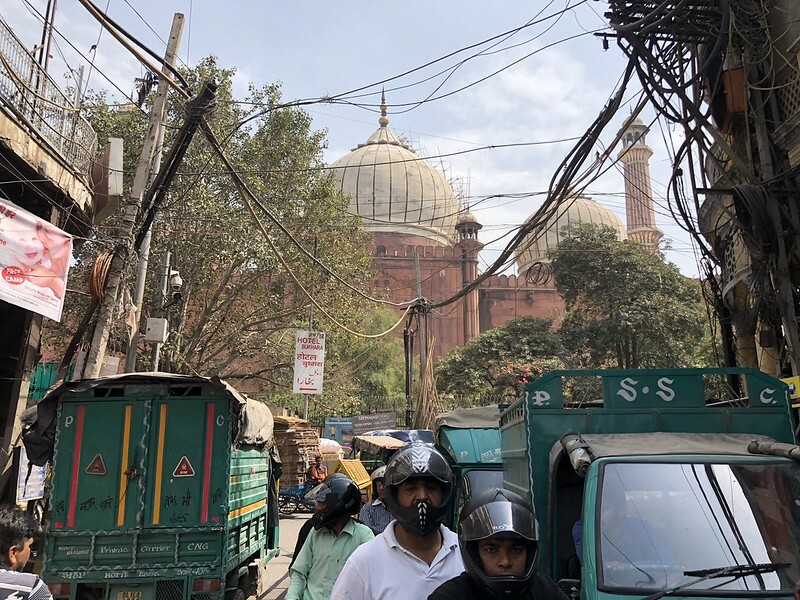 That picket fence protecting the mosque from chaotic Old Delhi is presently dressed up in pink bougainvillea. Knowing a good thing, homeless labourers sleep here every night. During the day you can’t help spotting their bags and clothes hanging from hooks nailed onto the boundary wall. 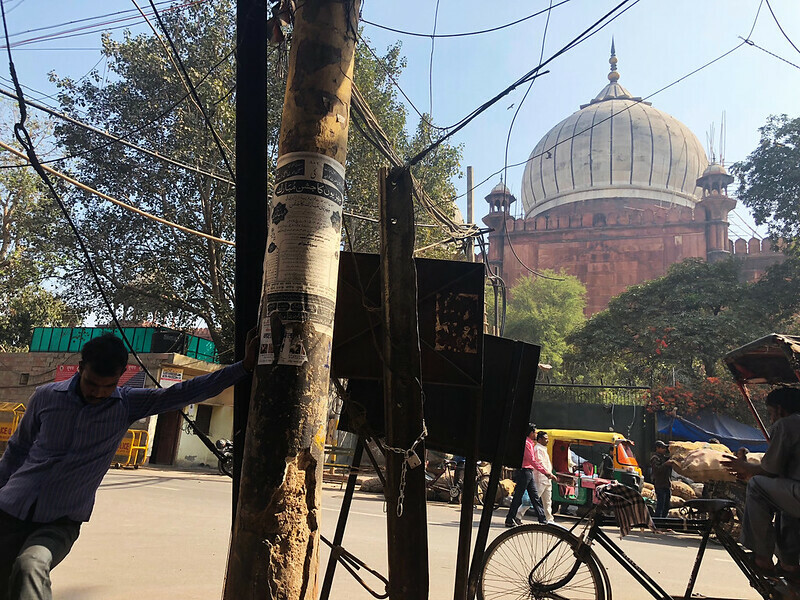 Lest The Delhi Walla forgets to mention, the most appropriate spot for contemplating the mosque’s rear is simply standing in front of the Jamia Hotel across the road. This beautiful old lodge should itself be declared a monument. It closed a few months ago, but the elegant balconies are, of course, still there to be admired. To stand under these disappearing architectural segments and gaze at the lesser-seen aspect of the historic mosque brings profound pleasure.